We are licensed for 30 children (8 under 2 year olds and the balance over 2). Our hours are: 7:30am - 5:30pm. We are open all year 'round including school holidays. Our 'Kaitiakitanga: Walking with Tane' programme is unique in Northland. Located on a 100 acre farm with a significant part being native forest, our tamariki have the opportunity to spend time in nature everyday. There are Puriri trees over 400 years old, friendly Tuna, streams to explore, trees to climb, and a maze of old trails to lead us on adventure and discovery. Learning experienced in the bush is brought back to our centre where our connections to papatūānuku are deeply embedded in our daily practice. Our practises are influenced by two current childcare philosophies: the 'children are their own best risk managers' practice as promoted by Claire Warden of Mindstretchers in Scotland, and in our Under 2 area, the Magda Gerber (RIE) philosophy. The heart of our programme at Open Spaces is our walks to The Wild Woods. We have adopted the 'children are their own best risk managers' practice as promoted by Claire Warden of Mindstretchers in Scotland. We put this to the test by allowing the children to spend on average 3 hours per week in The Wild Woods – a paddock with several stands of native bush, plus a track down to the creek at the back of the farm where there are REAL BIG EELS! 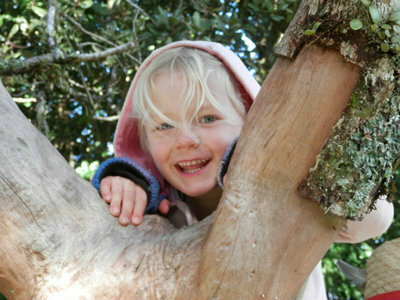 The children are able to climb, explore, build huts and learn to respect our natural environment. All part of our philosophy of Kiatiakitanga. We have also introduced FIRE into our curriculum with children learning to respect fire. We have a special fire bubble and practice fire safety with our tamariki as we use the fire to cook our food or to sit around when we have our kai times in the woods. We anticipate that if children learn to recognise how it feels to 'be secure' they will use those feelings in emotional situations later in life. Secondly, in the under 2 area we follow the Magda Gerber (RIE) philosophy. The underlying principle is one of mutual respect between child and carer. Also that children should not be put into a position that they can't get out of. The under two children also have the opportunity to spend as much time as possible in nature, and often come along on whole-centre walks to The Wild Woods.